The Corsa Speed tubular is Vittoria's fastest tubular road tire. The Corsa Speed is similar to the more all-round Corsa G+ tubular read review that I tested some time ago. The obvious difference (as the name suggests) is the Corsa Speed is completely optimized to provide the lowest possible rolling resistance. The tubeless version of this tire read review is the fastest road bike tire on the planet; I've been looking forward to testing the tubular version to see if it comes close to the tubeless version. The main difference between the Corsa Speed and Corsa G+ is the Speed makes use of just a single compound G+ compound which has been optimized to provide a low rolling resistance. The 4C G+ compound found on the Corsa G+ is a compromise between speed, grip, and mileage. To make the Speed even faster, it comes with a much thinner tread and doesn't use a Kevlar reinforced casing which means it will be less puncture resistant. When buying these tires, be aware the Corsa Speed is a no-compromise racing tire. Unlike the Corsa G+ tubular which is available in 23, 25, and 28 mm wide versions, the Corsa Speed is only available as a 23 mm wide version. Specified weight of the 23 mm version is 200 grams, my sample carries a bit more weight and comes in at 209 grams. The measured width comes in spot on at 23 mm wide. As expected, and just like the Corsa G+ tubular, the Corsa Speed makes use of a latex inner tube. The measured total thickness of the tire at the center of the tread comes in at just 1.5 mm which is much thinner than the 2.3 mm of the Corsa G+. The casing is a bit thinner as well at a thickness of 0.45 mm, the casing of the Corsa G+ has a thickness of 0.65 mm which should make it a much stronger tire. 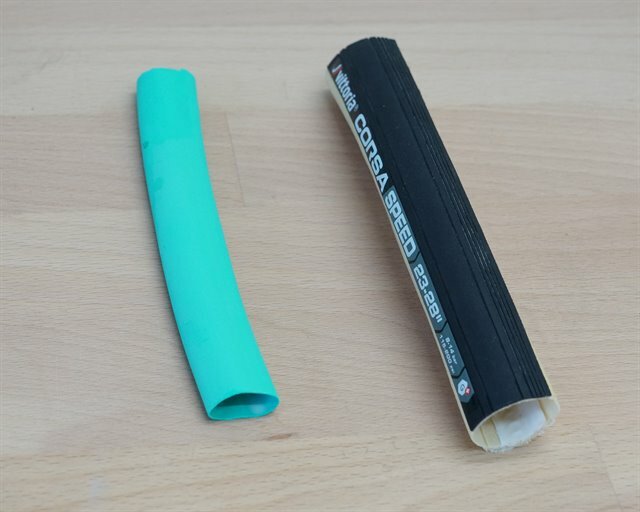 So how does the tubular version of the Corsa Speed compare to the insanely fast tubeless version? Rolling resistance of the tubular version is a bit higher, but still very low. At an air pressure of 120 psi / 8.3 bars, rolling resistance is 9.1 watts as compared to the 7.7 watts of the tubular version. At lower air pressures, the difference between these two tires stays close to 1.5 watts at a speed of 18 mph / 29 km/h and a load of 42.5 kg. The tubular version does have the advantage of being rated up to a maximum air pressure of 200 psi / 13.8 bars while the tubeless version maxes out at 130 psi / 9 bars. I've tested the tubular at 140 psi / 9.7 bars which resulted in a rolling resistance of 8.8 watts. When you're in a situation where the use of very high air pressures will make you faster, the tubular Speed at 200 psi might come very close to the tubeless Corsa Speed at 130 psi. When we compare the Corsa Speed tubular with the more all-round Corsa G+ tubular, the Corsa Speed holds an advantage of close to 3 watts across the air pressure range. Although 3 watts per tire at a speed of 18 mph / 29 km/h doesn't sound like much, be aware that for a pair of tires, at a speed of 28 mph / 45 km/h, this will be close to 10 watts gained or lost depending on tire choice. In the puncture resistance tests, the Speed performs poorly which can be expected from this kind of tire. When compared to the all-round Corsa G+ tubular that comes with a thicker tread and a kevlar reinforced casing, the Speed comes in as 37.5% less puncture resistant in the tread test. In the sidewall test, both tires score 3 points. If you're in the market for some no-compromise tubular tires, the Vittoria Corsa Speed will be an excellent tire as it will be very hard to find a faster tubular tire. Do be aware the Corsa Speed won't last long and wet grip and puncture resistance will be poor. If you're not doing time-trials, definitely go for the regular Corsa G+ tubular read review as it should last much longer and provides more grip.